Why hello, Dear Readers! Remember a few months ago when your sage old granny of a writer, Ms. Shakespeare threw her back out and laid on the floor in agony while episodes of Stan Lee's Super Humans played in the background taunting her in her inability to be a super hero? Oh, you don't? Okay. Well, maybe this post will remind you. Around that time I was thinking a lot about disabled anime and manga characters, like, where are they? Well, guess what? I found them! Apparently, they are all in Full Metal Alchemist and Full Metal Alchemist: Brotherhood! 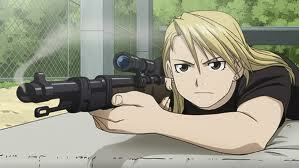 We are the Elric Brothers. We know a thing or two about pain and suffering. It is possible all of characters in this tale are differently-abled. 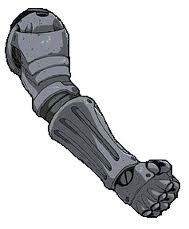 You've got Edward who is missing an arm and a leg, Alphonse who is missing a body, Izumi who is missing some internal organs, Havoc who ends up in a wheel chair, Roy who ends up blind, Lan Fan who is missing an arm and Hoenheim who is missing mortality. For goodness sake, Winrey's dog even has a prosthetic leg and there is a whole industry dedicated to automail. There are more missing parts in these two parallel series than I can shake my cane at! This show is an amputee fetishist's dream! Now, Dear Readers, because I can concentrate on one thing very very hard -- a trait some people might call obsessive, but I happen to call AMAZING -- I was able to watch both these series all the way through sometime in the last few weeks. 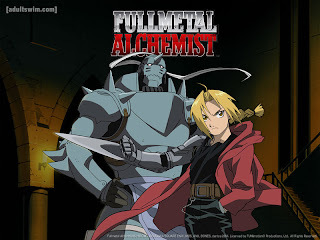 At the heart of both series are the Elric Brothers, Edward and Alphonse, two young alchemists who reside in a somewhat steampunky and somewhat pastoral military state that seems to be constantly at war with its neighbors. 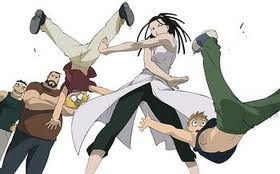 Their dad is a little absent and when their mom dies, they try to bring her back using a process called Human Transmutation. If you paid any attention in your Hermetic Studies class, you'll know that this isn't a very good idea. The boys end up paying a hefty toll physically and emotionally, and here is where our adventure begins. I think it's probably a good idea to look at the two series as just that, two series which don't have too much to do with one another, except that they do. I really loved both of them, but if you ask me which I like more -- oh, I'm so glad you asked-- I believe Brotherhood was the superior work. Wince, wince, wince. I know some thirteen-year-old-fangirl is out there getting ready to put me to rights about how: Brotherhood is lacking heart, and it doesn't dwell on the boys' childhood, and it is hard to understand if you haven't seen the original, to which this withered old hag of a cutey culture critic will say, "Listen, Youngster, a few years will put it all in perspective!" Brotherhood is just a more mature story. There is less guilt and more heroism. There is more hope but also more uncertainty. It's not a tale that keeps turning in on itself like the original (which isn't bad at all). It is a story that opens up and expands until it's huge and unwieldy and terrifying. 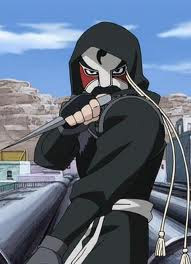 It stressed me out to watch Brotherhood, which, for me, means there was some stuff at stake there. But this isn't just about the ladies, there are a TON of badasses in this show! There are a ton of great fight scenes and a ton of ultra-squee moments. 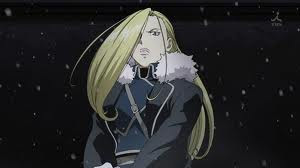 Even though I prefer Brotherhood I highly recommend both series, especially if you are on the mend from some dire old person injury and need something to contemplate while you recover. I'll leave it up to you to decide which you like more. Are you listening to this old lady when she is speaking to you? 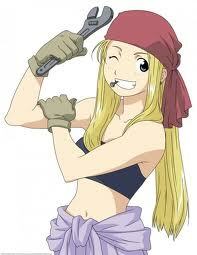 FMA, either way! WATCH IT! I find our old fan lady qualities fantastic, and I agree that your OCDs make you AMAZING(! ), if also a little anti-social. Ha! In honor of our oldster status I think we should invent a new term. We are not fangirls, because fangirls seldom see past the squee to the sophisticated and theoretical (sorry, fangirls, I know you are not all this way, some of you are quite insightful, so forgive me oh, insightful ones, for pidgeonholing you). I don't feel like we're quite "fangrannies" because...we aren't. Maybe we're big sister types? Fanee-chan (sounds gross though). Maybe we're just super analytical types? Fanalists? Anyway, FMLB is on my list of to watches. Someday I will have time. One day we will be fan grannies! Roy said I might be a fan-vestite.